Discussion in 'Vaping Related But Doesn't Fit In a Category' started by gsmit1, Jan 9, 2019. CaFF, Raymcconn, KingPin! and 15 others like this. SnapDragon NY, Letitia9, wildgypsy70 and 1 other person like this. SnapDragon NY, Letitia9 and wildgypsy70 like this. Awesome! Were you able to do it with the manufacturers software or did you have to Hack it to install the Firmware? Also do you get to keep it or are you sending it back? SnapDragon NY, Letitia9, Huckleberried and 1 other person like this. I would love to claim some erudite techno wizardry, but they gave me the file and I installed it. I did have some trouble getting windows to see the mod for a minute, but that was the only issue. That's why I asked him the other day if the start button on the ISP flash tool still went live. He told me to keep it Like he said, he forgot to put the bottle in the box, so I have to find a bottle, but that should be trivial. SnapDragon NY and SteveS45 like this. As soon as I can decipher the version number, I'll add a readme file. SnapDragon NY and PoppaVic like this. Wotofo gives you three bottles with each RAM, but only one tube. SnapDragon NY, MrMeowgi and PoppaVic like this. I put my profile on it. Man, that rda is just not floatin my boat at all. Hey well done! That's awesome! SnapDragon NY, gsmit1 and MrMeowgi like this. MrMeowgi and gsmit1 like this. nadalama, Vape Fan, jinx'd and 1 other person like this. nadalama and SnapDragon NY like this. gonna write a how to for it? Vape Fan, MrMeowgi and SnapDragon NY like this. In the end there really wasn't much to it, but I'll try to throw an explanation together later. Every Cut owner should download THIS file though just to have it just in case. MrMeowgi, KingPin! and SnapDragon NY like this. trying to upgrade only to brick the mod! You helped all of us on the Vsticking thread with upgrading and wallpaper there too! Vape Fan, Raymcconn, MrMeowgi and 4 others like this. I have a question. what does the update do ? I am a computer tard, deafly afraid to update anything computer wise. SnapDragon NY and nadalama like this. It was my impression that there is no update. What @gsmit1 restored to the Cut was the original firmware. MrMeowgi, SnapDragon NY and gsmit1 like this. I did use it to restore this one to working order. I'm glad you reminded me. I'm not sure if this is a newer build of the firmware or just the original that they don't have on their site. In any case it will revive a dead Cut. Like I say, I'll try to say a bit more later. SnapDragon NY, jinx'd and nadalama like this. Yes but what @MrMeowgi didn't know is that there wasn't an upgrade to the cut and loaded the wrong firmware. Bricking the mod. The original firmware for the Cut was not posted on the Desire site at all, @gsmit1 really had to hunt this down to restore this mod. Vape Fan and nadalama like this. that's what I thought, but wasn't sure. oh. I don't want to jack this thread, and I hope gsmit doesn't mind. batts for this thing, I want to get 2. do I really need a 25+amp battery ? I am now dripping it with a 18650 @44w and it working just fine. I don't plan to make this into a cloud machine. 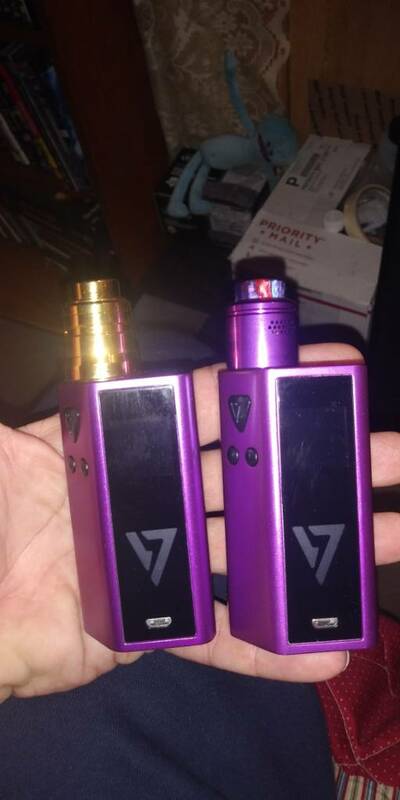 maybe I should just get the purple vapecell to keep the color coordinating thing going on. lol. gsmit1, SnapDragon NY, nadalama and 1 other person like this. gsmit1, MrMeowgi and nadalama like this. I put some SS in the canilla hoot, made it much better. kinda tart before. I'm really dig'n this mod. and I just noticed that its firing at about 12v. gadget!, nadalama and EMusic like this. Raymcconn, Vape Fan, gsmit1 and 5 others like this. U B pimp'n , Bro. yeah, it was you. I don't think I would have picked the pruple. but I thought "you know, that does look nice. and it would spiff up the collection display". I should have got another in a diff color. I mean $17, hell yeah. btw, for those that don't know. the triangle turns red when charging, just say'n. I was going to take a pic of it, then all of a sudden the light went blue. I am going to change this way till I get 21700 for it = the adapter is kind of a pita. so I'm just leaving it in. oh, and it seems to charge pretty fast also, 2a perhaps = I didn't look in the manual. SnapDragon NY, MrMeowgi and nadalama like this. and, I just noticed. as it gets close to the end of a charge, the red light starts to pulse. gsmit1, SnapDragon NY and MrMeowgi like this. I just figured out(suspected, but didn't know) that it has a protective covering on the black screen. take it off if you want bling shiny black. gsmit1, gadget! and SnapDragon NY like this. nadalama, gadget! and SnapDragon NY like this. it fits so precisely that I thought that it was their version of anti fingerprint . then I seen a TINY place at a corner and peeled it off. makes a nice mod even nicer. sept for fingerprints now = just don't touch it, and easy to clean anyway. gsmit1, nadalama and SnapDragon NY like this. 30T for me. 80 watts. That's amps. Not volts. You can't get 12 volts out of any single battery we use. Actually, not even 2. Volts is under your big wattage display. TBH, Vapcell is a rewrap. Get the real deal, and purple wraps if that's what you want. For a single 21700 in a regulated device(or even mech) take a look at Molicel P42A 21700 or Samsung 40T. Both have a measurable amount of more run time than Vapecell. jinx'd and gsmit1 like this. Unless I'm really missing something, there doesn't appear to be a way to check the firmware version on the mod itself. I guess they made a mistake. mine actually does say 0.00A. why would there be 2 watt readouts ? thanx, didn't know. glad I didn't order yet. are the 21700 the most used in mech's ? I want to get a mech someday. would be nice to already have a batt/s for it. do they usually use 1 or 2 ? jinx'd and Vape Fan like this. thanx. I should have said tube mech's. forgive, I'm still new. jinx'd and MrMeowgi like this. I have since this thread found out that @nadalama and I speak the same language. Probably not. I'm a dinosaur! I got the gist of what you were talking about with flashing this mod, but I wouldn't have a clue how to actually get it done. I came to IT in the days of the IBM 360 mainframe. Computing was still magic back then!